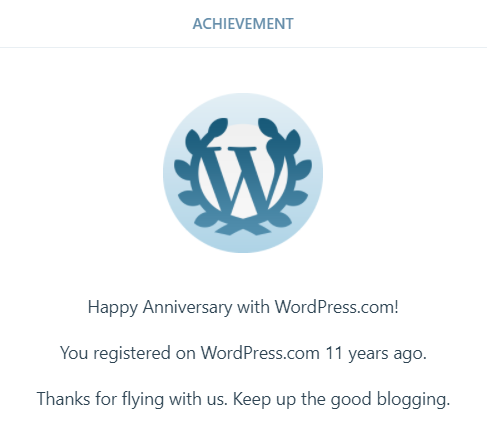 It seems I have been registered with WordPress.com for 11 years now according to the little note from WordPress last week. Thomo’s Hole has been around considerably longer however. The early efforts are recorded for posterity in the Internet Archive (WayBack Machine). Web pages from the days when the number of sites on the Internet numbered around 100,000, not the billions that exist today. Thomo’s Hole originally pre-dated Internet Banking, iPhones, the Spice Girls and Italy’s second failure to beat a Korea in the football World Cup. However, as a registered user of WordPress, initially self-hosted (or rather Jeffro hosted) then later with the thomo.coldie.net URL pointing to a WordPress.com site, then yes, it has been 11 years. There were other blogging platforms (or better, CMSs) previously. Microsoft Live Spaces was sweet to use, early versions of Drupal, phpNuke and even earlier versions of hand-crafted HTML and CSS. Yep, been here a while. I dare say Thomo’s Hole will remain around long after I am gone as well, although perhaps the thomo.coldie.net URL will drift out of use. The only real question concerning me today is, “do I try and monetize Thomo’s Hole?”. WordPress gets the revenue from the little ads you see down below. If I do monetize, should I move it to a platform where I can maximize the revenue stream? A few questions to ponder tonight while I am basing up the Poles ready for painting or starting work on the JGSDF Type 74 or perhaps even finishing another book ready for revueing. Plenty of time to ponder.